BOCA RATON, FL – The Kelsey B. Diamantis TS Scholarship Family Foundation, Inc., Dollars 4 Tic Scholars, a local non-profit organization that awards scholarships to students with Tourette Syndrome, invites the public to participate in its “D4TS Dining Days” Fall Fundraiser on Tuesday, November 15, 2016 from 4:00 pm -8:00 pm at Corner Bakery Café, 2240 NW 19th St., Boca Raton. 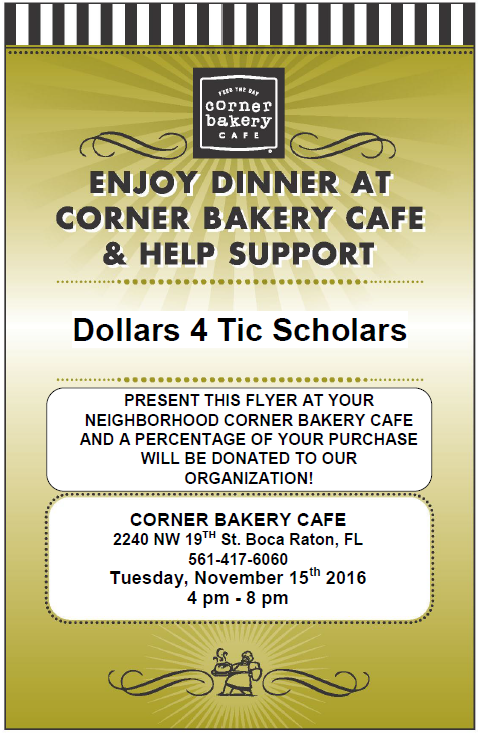 Corner Bakery Café has generously offered to donate a percentage of each dining purchase to Dollars 4 Tic Scholar’s Scholarship program. Enjoy a family dinner at Corner Baker Café and help to raise money for college students who have Tourette Syndrome with your dinner purchase. A printed flyer must be presented at the restaurant to participate, and is available by visiting https://www.dollars4ticscholars.org/corner-bakery-cafe/ online. Find more information available at https://www.dollars4ticscholars.org/dining-days/. Dollars 4 Tic Scholars may be reached at 561-487-9526, at https://www.dollars4ticscholars.org, on Facebook at “Dollars4TicScholars”, or by email at info@dollars4ticscholars.org.